Kaduna State Government in partnership with a non governmental organization, Prisoners Rehabilitation and Welfare Action (PRAWA) is rehabilitating 30 victims of human trafficking. Speaking during the opening ceremony of the training in Kaduna, PRAWA Program officer, Barrister Ogechi Ogu, said the training was to touch the lives of the victims positively and make them self sufficient and independent. She said the NGO identified poverty as a major factor responsible for trafficking hence the need to change their minds before they fall victims of the traffickers. Bar. Ogu while cautioning the beneficiaries on sustainability said the training which was in two phases of Life planning and Entrepreneurship development programme was to guide the beneficiaries chose trade of their choice afterwhich they will be given six months of extensive training in their skill acquisition area of choice. According to her, “PRAWA with sponsorship of Netherlands embassy is in Kaduna because it is one of the 5 states along Anambra, Edo, Ogun and Kano with high prevalence cases of human trafficking just as the training is also taking place simultaneously in the states. “PRAWA is closely working with National Agency for the Prohibition of Trafficking in Persons and other related matters, NAPTIP in the following areas: Identification of victims of human trafficking, selection of beneficiaries, carrying out awareness creation activities in targeted schools and communities. Engagement of stakeholders relevant to the project activities and counselling of victims and other areas where they can make significant contributions in the course of project implementation. “So after the training which is in two phases of life planning skills training and entrepreneurship development programme to enable them acquire identified vocational skills, we will set aside a “seed capital” that will serve as a takeoff grant for revolving credit scheme. “We will also facilitate the development of an MoU and the establishment of a self-help group (SHG) management committee to oversee the revolving scheme. Also establish 10 units of SHG (each group shall consist of 10 – 15 victims of human trafficking),” Bar. Ogu stated. Earlier, Zonal Commander, Kano office of NAPTIP, Shehu Umar lamented that cases of human trafficking is rampant hence the need to partner with PRAWA to eradicate the ugly menace to the bearest minimum. The Commander represented by his Head of Counseling and Rehabilitation unit, Malam Ado Labaran said the traffickers capitalize on the vulnerability of the potential victims to brainwash them. According to him, “You will think they are out to help you but they are exploiting you. They capitalize on the vulnerability of the potential victims to brainwash and cajole with a token. “And this is what the training is all about. To train and give you all you need to move you away from idleness because an idle mind they say is a devils workshop. So, we implore you to utilize the opportunity brought to your step and listen in order to make you self dependent, provide for your self and your family,” he said. 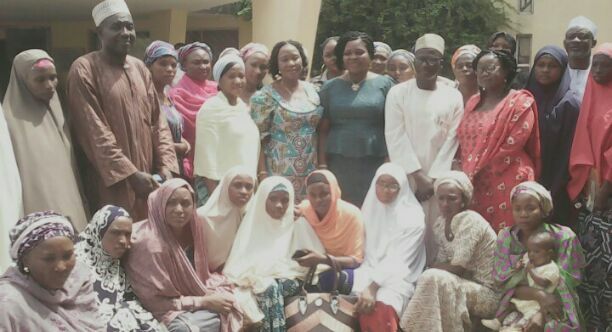 Commissioner of Women Affairs, Hajiya Rabi Abdulsalam represented by Head of Social welfare, Ibraheem Daboh Musa, urged the beneficiaries to grab the opportunity with two hands and utilize it in order to move away from poverty and reduce trafficking in the state. Resource person and Executive Director of Gender Awareness Trust, Dr. Lydia Umar said a lot of the beneficiaries are vulnerable and potential victims of human trafficking hence the need to sensitize, train them on skill acquisition in order not to fall victims of the traffickers who go out there to brainwash them and exploit them. Meanwhile, a victim of human trafficking, an indigene of Kaduna who don’t want her name on print narrated how she was taken to Kano where she was engaged in child labour and exploited but has now been reunited with her parents in Zaria.